Just washed up, finished. 5.5 hours from heating liquor to knock out to fermenter. Had a neighbor come over part way, made cleaning a lot more efficient. Added the recipe while heating the liquor, with a single infusion 152F for 75 minutes, 1.25 Qt/Lb thickness. This is thicker than usual and I had to really work to eliminate dough balls. Mash Out for 10 minutes at 170F. Mineralized to “Yellow Bitter” in Bru’n Water – and a tiny bit of acid in both hot liquor and mash. 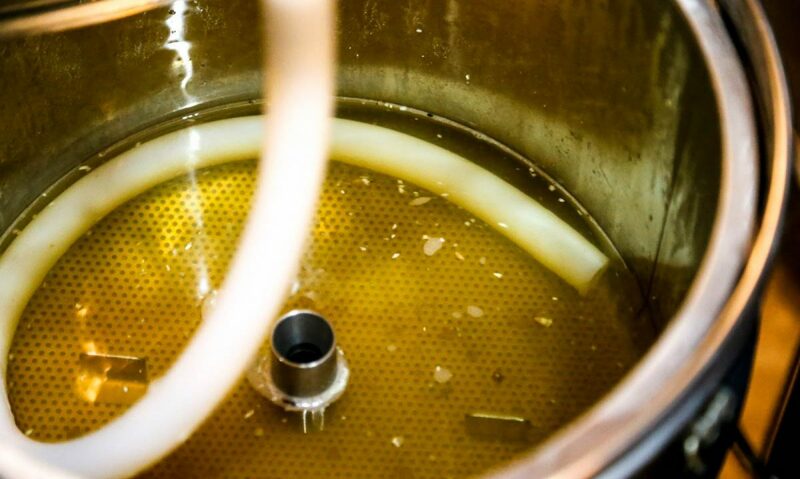 Longer mash to ensure conversion. Fly sparge lautering, took just over 45 minutes. Chose to fly to measure impact on efficiency. Used a few drops of de-foam, and ran off into the hop spider to collect any miscellaneous husks or malt. Neighbor came by during lauter – helped through the rest (and had a few beers!). Clean up with wet vaac during boil. Reduced my original hop additions to 5 total, but will dry hop with 2 additional ounces after primary. Have been only achieving 65-70% mash efficiency the last few brews. Today, with the slow fly sparge, I achieved 86%. Some of this is from the Marris Otter, with a slightly fatter kernel than standard 2-row. The rest I attribute to the fly sparge. I am not a patient man, but really concentrated on a slow even lauter (I also sparged with RO water, low alkalinity and about 173F). Started boil when I saw clear surface break, added first hop addition. Big fluffy hot break formed about 30 minutes in – noticed during the flavor hop addition. 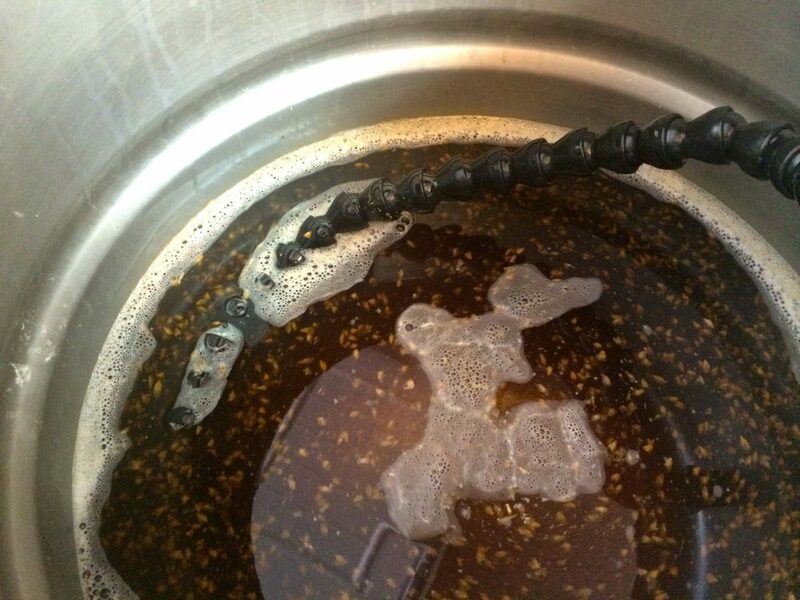 Hop spider worked very well, wort out of the kettle was fairly clear. Oxygenated at 0.12 LPM with slow flow through the Chill Wizard. The new software, brewing from a ‘recipe’ worked very well. The timer and a beep (I set the alerts in the system configuration) helped to indicate when each step needed attention. Of great appreciation, the step timers started only after the step temperature was achieved. I was a bit concerned as hitting and maintaining mash out required some of the old system shuffle, but I also had a fan blowing to cool me off a bit – the Brew Magic is a giant heat sink… the little wind took some of heat from the tun. Everything stabilized when I turned the fan off. Conclusion: I will continue to add new ‘recipes’ to represent specific mash schedules. I have already setup several of these in Beer Smith and look forward to repeating them with new brews. The interface required a bit more interaction than I expected, but mostly the issue was swapping out between notification screens. A heating notification occurs when you are heating the mash faster than 2 degrees a minute. That exits to the graph and not the primary screen. You need to Arrow Key back to that screen. Otherwise, everything worked better than I expected. Now someone PLEASE turn off the heat and humidity here in Central Texas! No double brew days in the summer here.